Las Vegas, Nevada – conjures up all kinds of frivolous images doesn’t it? What goes on in Vegas stays in Vegas right? Well, I’m about to depart from that as I share my thoughts on a fascinating time spent at IBM Amplify – the conference which brings you the message of Watson, cognitive computing capability which is not only going to transform retail but the very essence of our lives. In a packed three days we heard and learnt an awful lot about Watson and how IBM is bringing its cognitive capability to bear on business around the world. 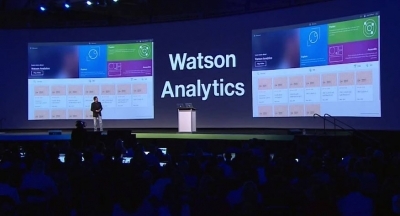 How they are teaming with brands such as Salesforce to bringWatson and Einstein together and how the vision for a cognitive future will help shape all our lives. And in perhaps the most popular keynote session we heard from Will Smith on what motivates him, how he has developed his brand and why we should NEVER go to see Wild Wild West! So what were the key takeaways for this IBM Futurist? The sense of urgency at the conference was palpable and was spelt out in many of the keynote sessions, in particular from CEO Ginni Rometty who advised delegates that the pace of change is so rapid that cognitive must be a part of all their businesses – starting right now. The message was clear, start experimenting now to avoid being left behind. The only reservation for me being that ease of consumption by businesses – how to get started on the cognitive journey with Watson – still needs to be spelt out very clearly. Perhaps the most significant capability which Watson delivers for retailers is the ability to not only drive incredibly deep and meaningful relationships by knowing their customers intimately but to be able to do so whilst avoiding the intrusiveness so often associated with this. Retail brands must be relevant and contextual in order to drive advocacy and stickiness with their customers; that much is known. But the gamechanger which Watson delivers is the ability to tap into all the hitherto dark data – unstructured data previously invisible to conventional computing – to uncover insights never before available. The use and application of this information however will be key to success. In a great session by fellow IBM Futurist Jason Falls, he made the case for augmented rather than artificial intelligence. The notion that cognitive taken to its logical conclusion will make society lazy and that we will become both redundant and dependent on the technology. The comforting news is that the inflection point will see harmony between humans and the cognitive learning capability rapidly being deployed. Where perhaps we viewed the technology as a threat, I predict that when we’re back in a year’s time, the talk will all be about how cognitive supports – augments - rather than replaces humans. As Harriet Green, IBM Global Head of Watson Commerce succinctly put it in her keynote, IBM has 24 months lead on the competition with Watson; which begs the question in such a fast changing world, will the competition ever catch up? If cognitive means to learn, reason, understand and perceive then maybe we all have a little Watson inside us?